Employee education is one of the critical areas of benefits that can often perplex companies. According to a recent survey from Aflac, half of employees only spend 30 minutes or less making benefit selections during the open enrollment period each year. This means employers have a short window of time to educate employees and make sure they are armed with the right information to feel confident in their benefits selection. To do this effectively, HR needs to move past flat communication like brochures, handouts and lengthy employee packets and look for ways to meet employees where they live — online. By testing out innovations that create a rich experience, while still being simple and intuitive, employers can grab the attention of their workforce and make sure key information is communicated. For mid to large sized corporations, hosting a virtual benefits fair can provide a forum for geographically dispersed employees to ask questions in a dynamic setting. Last year, Affiliated Computer Services, Inc., a Xerox company, decided to manage the process by creating a virtual benefits fair in support of its open enrollment season. The company provided 45,000 of its U.S.-based employees an entirely new way of taking ownership of their health care options through an interactive, realistic and personal experience – all from the comfort of their homes or offices. “We felt [the technology] was ideally geared toward an enrollment event to help drive better success for employees as they’re making some pretty complex decisions that require a level of engagement that, historically, has been tough to garner. Traditional benefits fairs are costly and only attracted about 11 percent of the ACS employee population in the past,” says Rohail Khan, executive managing director for total benefits outsourcing with ACS. 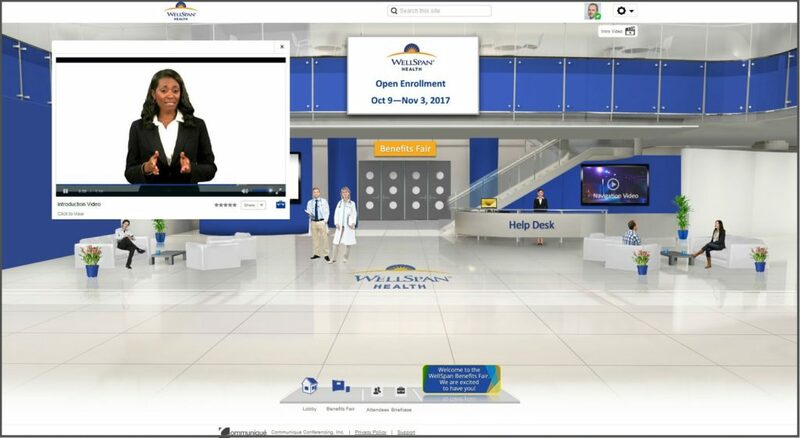 The virtual benefits fair not only gave employees greater access to HR support via the educational tools and access to documents provided in the environment, it also helped the company eliminate some of the fixed costs associated with enrollment, such as paper and postage for enrollment kits. The virtual benefits fair took about six weeks to set up. Thousands of employees took advantage of the virtual benefits fair, with more than 20,000 documents being downloaded and the average visit lasting more than an hour. During the first week of the four-week enrollment period, over 5,000 employees spent an average of 45 minutes in the interactive, virtual benefits fair. “What that showed us was that if the information is presented in a way that will engage an associate in the right kind of conversation, then associates will actually take the time to understand it and try to leverage it to drive a better outcome,” says Khan. The virtual benefits fair looked like a convention center, with various booths and kiosks. “It was a way for them to walk a convention floor, collect information that was important or germane in their briefcase and then refer back to it when they wanted to,” says Khan. The booths included voluntary benefits, planning for your expenses, choosing a medical plan, changing your benefits, dental and vision benefits, life and disability benefits, and new hires and rehires. After clicking on a booth, employees could open a chat window with the person staffing that booth (usually someone from a provider company) or open a Skype video chat. Employees could also choose to chat via text or have the person staffing the booth contact them by phone. There was also a conference hall employees could visit to watch live or on-demand videos on such topics as health plan options, the consumer choice plan (is it right for you? ), the health savings account and making the most of your flexible spending account. The fair also included a virtual lounge where employees could chat with each other about the various benefits and plan features. ACS didn’t supplement its virtual benefits fair with a physical one because it would have been too cost prohibitive to get a heavy concentration of employees in one place. The technology can be used by multinational organizations that have employees in multiple locations. Language translation components can be added and different versions for different countries or even different departments can be created. Another benefit is that employers can get immediate feedback on what the high traffic areas are, which can help them design their communications. Each year, most employees engage in some way with their annual health benefits enrollment. New research from Bank of America Merrill Lynch shows that when employers present employees with an easy, one-click option to enroll in or make a contribution change to their 401(k) plan during the annual health benefits process, the result is significant increases in 401(k) participation – either through new employees signing up to contribute or through current employees increasing their contributions. As retirement and health care benefits become increasingly intertwined, employers have an opportunity to increase employee engagement in their benefits plans. There are three steps employers need to take when rethinking their benefits strategy and engaging with employees; embrace a proactive rather than reactive benefits strategy, think digital when it comes to employee communications and consider the next generation of employee benefits as a way to differentiate from the competition. 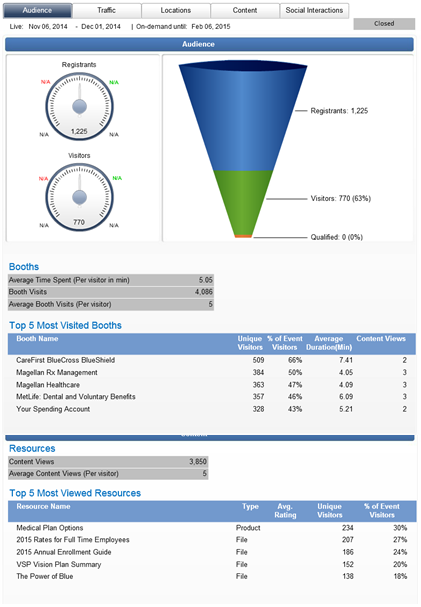 For more information on Communique’s Virtual Benefits Fair platform.